Snorkeling with a whale shark has always ranked high on Nicole’s bucket list. It’s one of those rare natural encounters that few people get to experience in their lifetime. The gentle giants, which can grow as long as 41 feet, are not dangerous creatures and should not be confused with killer whales or sharks with sharp pointy teeth. A few years ago, when we were planning our Round-the-World adventure, we researched the best locations to find whale sharks. Our hope was to have an opportunity to swim alongside the world’s largest fish, but our itinerary didn’t bring us close enough. Whale sharks only migrate to certain locations around the world, searching for specific food sources like plankton, microscopic plants and fish eggs. Even if you’re lucky enough to be in the right place at the right time, there is still no guarantee of a whale shark sighting. Though the elusive shark can be seen in many of the world’s tropical seas, there are a few places where your chances of success are much greater. 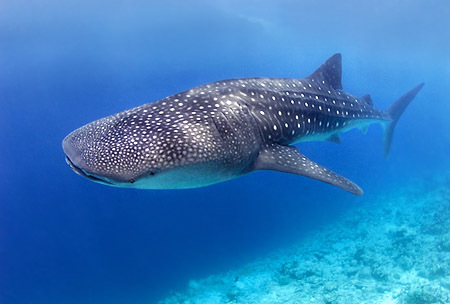 Along with Mexico and Honduras, Belize is one of the most popular locations in the Americas to spot whale sharks. Gladden Spit in the Belize Barrier Reef, located about 26 miles off the coast of Placencia, hosts a high concentration of whale sharks during the months of April and May, when schools of cubera snapper are actively spawning in the area. Gladden Spit is also a protected area, so the park rangers only allow six tour operator boats at a time, which contributes to the intimacy of the experience. We spoke to several Belizean locals, scuba dive shops, and tour operators, curious about the best time to spot a whale shark. Depending on who you ask, each person has a different opinion with conflicting results. Some say your chances are highest 3 days BEFORE the full moon, some say 3 days AFTER the full moon, others say its THE DAY OF the full moon. But everyone will agree that it’s most likely to see the whale sharks surrounding the full moons of April and May, although even that’s not guaranteed (sometimes Mother Nature doesn’t read the tourist brochures). How do you find the Whale Sharks? Unlike a whale, whale sharks do not need to surface for air, making them very difficult to spot. Eric, our fearless snorkeling guide with Splash Dive Center, briefed us on the unique process for spotting the underwater giants. The process is actually quite fascinating. When Eric originally explained it to us we thought he was playing around with our ignorance. He wasn’t. Belizean tour operators have fish tracking systems installed in their boats that search for schools of large fish that frequent Gladden Spit. The ideal fish they look for is the Cubera Snappers because the whale sharks like to eat their eggs. Once a school of snappers are found, scuba divers enter the water and follow the fish. When the scuba divers get close enough, they collect in a circle above the fish and link arms together. Eager snorklers rest on the ocean surface, intently focused on the deep blue sea, searching for shadows in the distance. Thousands of tiny bubbles float towards the surface, simulating the cloudy spawning process of the snapper. The whale sharks, not being the most intelligent creatures, are tricked into thinking that the bubbles are actually its food source. They rise from the depths of the deep blue to feed, their huge mouths wide open, scooping up the bubbles. The more bubbles the scuba divers can make, the better the chance of attracting the whale sharks! 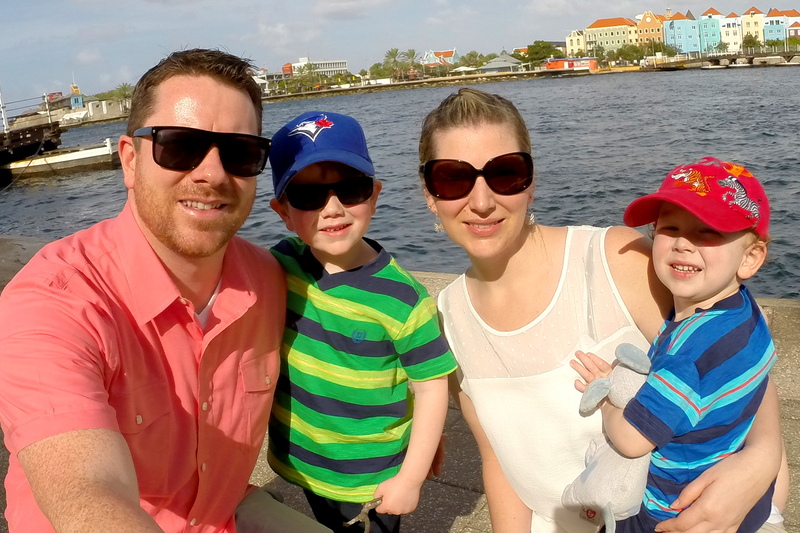 When we arrived in Placencia, our spirits were high. Our tour with Splash Dive Center was strategically planned for the day of the full moon in May, one day after our snorkeling trip to Laughing Bird Caye. We couldn’t have timed it better if we tried. Now it was up to the whale sharks and mother nature to cooperate. We were warned that the full moon can bring on high winds and rough seas, so we were pleasantly surprised this was not the case on the morning of the tour. The winds were calm, the water was like glass, the sun was shining – everything was falling into place. The Burning Question – Did we get to Snorkel with Whale Sharks?! When we first jumped into the water it was a strange, creepy feeling. The warm water was so dark and blue, with nothing in sight except scuba divers 50 feet below. In every direction, all we could see was the water slowly changing from indigo blue to black, then nothing. We found the snorkeling to be a great way to search for the sharks. Warren, our adventurous boat captain, was constantly in talks with the other boats, giving the snorkelers a slight advantage over the scuba divers. If other divers have better luck 100 feet away, snorkelers can easily jump back in the boat and get dropped closer to the action. Our first two attempts in the morning were unsuccessful. After about an hour in the water, we took a break and left the protected area for lunch and snorkel in the shallow coral reef. It was amazing that in such a short distance, the water went from thousands of feet deep to less than 10 feet. Our team had positive feelings for the afternoon sessions. As soon as we re-entered Gladden Spit, we spotted a pod of dolphins. We immediately jumped into the water and swam with them for a few moments before they got bored and moved on. Then the scuba divers descended and began simulating the spawning process again. 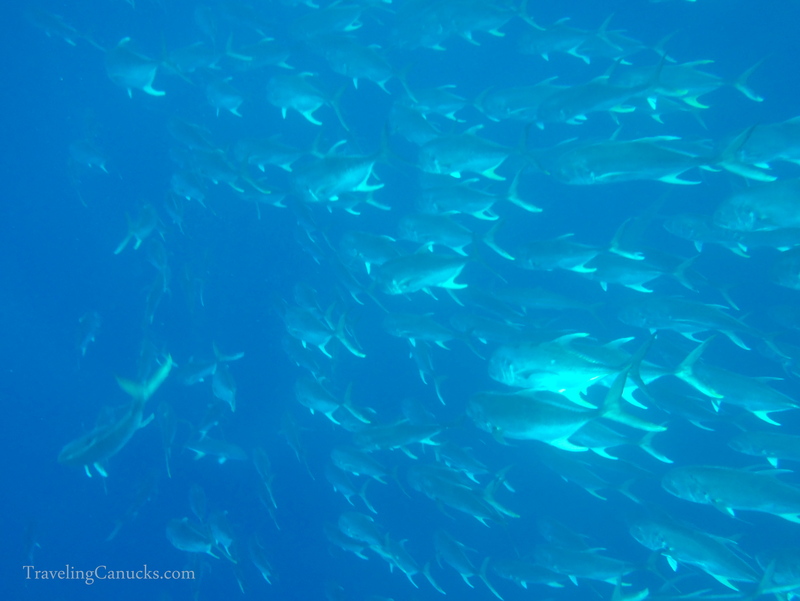 We started to get that warm, fuzzy feeling when we saw a school of thousands of fish followed by three remora fish, commonly found attached to sharks. The moment felt right, so we floated on the surface and waited with anticipation. After about 45 minutes of following the scuba divers, Eric made the call. We would head back the boat. Although the stars were literally in alignment, the elusive shark was just to shy to make an appearance. Sadly, nobody saw a whale shark that day. As Eric put it, “This is the ocean, we never know what we’ll see”. We were reminded that spotting whale sharks in the open ocean is like going on an African safari and spotting a leopard, there’s never a guarantee. Although we were disappointed that we didn’t spot a whale shark, it was still an incredible experience swimming in the deep blue sea of the Belize Barrier Reef. It’s not every day we get to play in the world’s second largest reef system! Have you ever seen a Whale Shark in its natural habitat? Sorry you didn’t get to see the whale shark, but what a great experience anyway. It’s really interesting about the process the tour operators go through to spot the whales. Actually, it’s all very interesting — great pics, too. Thanks Cathy! Yeah, it was a little disappointing that we didn’t get to swim with a whale shark but the experience was still awesome. oh man, feel bad for you guys. we were lucky to get to swim with one in mexico last year off isla holbox. dont mean to run it in, but it was so so so good. one guy we met said when he went there were 30+ in the water all around him. interesting technique to find them! a mate recently went swimming with them off western australia, and they had a plane spotter. hope you guys get your chance one day! Maybe next time we will try Mexico. We will definitely try again. We’ve swam with other types of sharks and it’s really fun. Highly recommended. We’re still desperate to snorkel with whalesharks, we kept missing them all over the world! Congrats on crossing that one off your bucket list and thanks for the awesome tips! 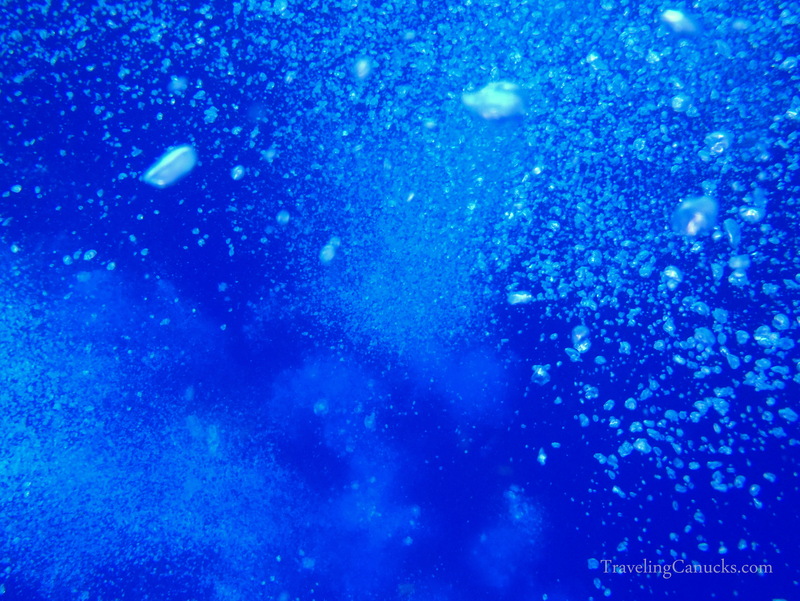 Interesting about the bubbles, I’ve dived with whale sharks on several occasions and we were always told that the bubbles scared them away. My best experience was when I got separated from my group in the Galapagos and had a whale shark all to myself for a few minutes -pure bliss and one of the best moments of my life! Wow, great story. We loved the Galapagos. I hadn’t appreciated just how difficult it would be to see a whale shark. Guess you should have gone three days after the full moon. I’ve seen orcas out in the ocean – a tear-jerkingly beautiful experience. We did. Swimming with the dolphins was a highlight for sure! This sounds like a great adventure! That water is amazingly blue. Made me want to jump right in. It is too bad there were no whale sharks but seems it was a good experience anyways. The water in Belize is amazing! If you like sea-life, you have to visit. I had never heard or read a clear explanation on “what was the best way to find Whale Sharks” … thank you so much for this post! Better luck next time! I’m very jealous, this is absolutely fascinating! It would be amazing to swim with one of these but the attempt still sounds fun! Agreed. Next time we hope we will be lucky. Too bad it didn’t work out! I haven’t seen them either, but they are high on my wish list as well. I hope you’ll get to see them on another trip!! Us too! We will keep trying. I don’t think I’ve even seen a photo of one of these before. Fascinating – what an experience! Loved the story. Sad ending, lol. The blue water was spectacular. Sorry we didn’t meetup in Vancouver. I know. Maybe at the next TBEX. Great post, I really enjoyed reading about the process of searching out the whale sharks. I almost jumped at the chance to see them in the Philippines, but never did. Too bad you weren’t able to spot any, but the entire experience sounds thrilling! It was really an interesting experience. We wanted to see them too in the philippeans but didn’t get the chance. Absolutely. Belize has some of the best diving! Great for snorkeling as well since the reef is very shallow. Despite not seeing a whale shark, this still sounds like a fun adventure. At least you got to swim with dolphins. 🙂 I’ve had a few dolphin encounters while surfing in San Diego, and I’m always blown away to see them swimming in the wild. Yeah, they were really curious. Kept coming around a couple times to check us out. It was really cool. It would be so cool to swim with one of these creatures. I still get excited when I see dolphins while I’m surfing. These are great tips! We haven’t been surfing in years! Would be amazing to see them while surfing. Shame you didn’t see them this time around. But there are other places to see them. And, wow! the big blue is amazing, isn’t it? Yes – it really is quite amazing out in the big blue! That alone was worth the extra effort. It sounds like a great experience; too bad you didn’t have a chance to see any whale sharks. man I have beeen dyyyying to dive with one of those!! I would probably freak out if I was swimming along and came next to one of those!!! We were a little worried that we would be nervous. But, we’ll have to wait until the next time to see. You should to Western Australia. They spotter planes to find whale sharks, so it is almost 100% guarantee to swim with whale sharks. That sounds like a much easier way to track the whale sharks! very awesome pictures. swimming in the second largest reef in the world isn’t an everyday occurrence. it’s good to know you had a good time even though none of those whale sharks came about. Although my country is a maritime country, I have not had the experience of diving in the sea view sea creatures. Reading the above article, I felt inspired to try diving immediately see the beauty of the sea. Thank you for experience. Hate do be disagreeable here, but when you say “unlike a typical whale, whale sharks don’t need to surface for air” it is implies they are whales. They don’t need to surface for air because they are sharks (fish). With gills and much different from a mammal. Just clarifying. Other than that I really enjoyed this article. I went on a whale shark dive in Belize, and like you saw nothing. Nothing but open ocean that is. Strange disorienting feeling. Better luck next time! I was lucky enough to see a few when I went to the Philippines in Donsol (same place Kat mentioned) – just posted about it with photos from snorkeling with them at this below link. I had the opportunity to swim with whale sharks a couple weeks ago in Mexico. I’m sorry to read you didn’t get to see them! I was so nervous going out on the boat ride that we wouldn’t see them, but we got lucky the day we went out and got the opportunity to swim next to three different ones. It was interesting to read your experience since it was a bit different from mine. We stayed on the boat until a whale shark was spotted and I don’t remember seeing any divers but I wonder if they were there before we arrived in the spot – there was a lot of correspondence going on in Spanish on their radio transmitter so all the boats were staying in close contact as we tried to find the whale sharks. Good luck with the whale sharks. I hope you get to see some soon, and that you also have a GOOD experience!